At my last church, we had an annual pie sale on Labor Day weekend. We had to set up a number of tables in our fellowship hall, and it was often pretty tight trying to put up enough round tables for approximately 300 pies. The last time I worked the sale, at one point, after 8 round tables were out only in ½ of the social hall, some of us got worried that the way would be too narrow around the tables, and folks who came to buy pies might accidentally run into pies and knock them on the floor. We had newspaper covering the tables, and paper plates all arranged out to the edges, but only a few pies out, and they were in the middle of the tables. So before we put most of the pies out on the tables, we needed a test. I was asked me to walk around the tables, and see if my backside knocked anything off. I had to enter at a narrow spot between a table and one of the social hall walls, and I am pleased to say that, despite my ample backside, I was able to navigate that tough pathway, and didn’t knock anything down. It reminded me a bit of today’s scripture passage and Jesus’ warning that the pathway is narrow that leads to life. Jesus has completed his section on how to live out the Christian faith, and now concludes his sermon on the mount with a series of warnings. 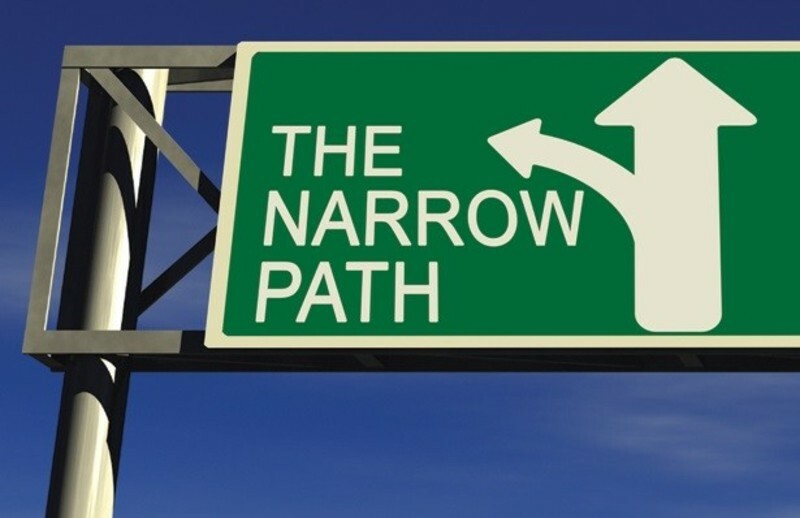 Today, we will focus on two first, Jesus talks about the narrow way, although it is actually a narrow sheep gate, followed by a tough path that leads to life. Then there is a second warning about false prophets, also known as “wolves in sheep’s clothing.” Let’s see what Jesus has in mind for us today as we draw near the end of Jesus’ Sermon on the Mount in Matthew, chapters 5-7. So many things can distract us from the narrow way of following Christ and his teachings in our lives. I am reminded of the short story “Rag Tag Army”, in a collection of stories known as The Way of the Wolf by Martin Bell. He talks about Jesus leading his group of followers on a long pathway, and the lack of progress they make due to distraction. “Jesus keeps stopping along the path to pick up one of his tinier followers who decided to wander off and play with a frog, or run in a field, or whose foot got tangled in the underbrush. He’ll never get anywhere that way, and yet the march goes on…”The goal of the disciple, however, is able to find that narrow gate, pass through it, and then remain on the difficult pathway ahead that leads to real life. What is the meaning of this? I think, unfortunately, that this way to life through the narrow gate has been misinterpreted by both society and the Church in general. It has to do with how we interpret the word “narrow.” The American Heritage Dictionary defines narrow as follows-“Of small or limited width, limited in area or scope.” But what Christians are not to become is narrow minded, as the dictionary defines-“Lacking breadth of view, bigoted, intolerant.” What kind of narrow gate, tough path and way of life was Jesus speaking about? Not a narrow minded one. Instead, Jesus wants us to focus narrowly on his sermon and have a broad, expansive love for others and for the world in which we live. He even summed up, that is narrowed down the main points of his sermon by giving us the golden rule, “Treat others as you want to be treated” which I preached upon last Sunday (Matthew 7:12)We, as disciples of Jesus Christ need to have a narrow focus on what is important- Christ’s teachings. Doing so changes us, changes the world, and leads to a better life. Are there Christians who have demonstrated a narrow focus on Jesus’ Sermon on the Mount, who have entered through the narrow gate, and tread the difficult pathway that leads to real life? Yes-hundreds of thousands who have followed Jesus’ teachings from the Sermon on the Mount, often through incredibly difficult circumstances. Consider the following example of one Christian woman and a group of Christians who were brought together through tragic circumstances. Charlie Robert’s wife, Marie Monville relied upon her Christian faith to carry her through the worst time in her life. She also forgave Charlie, and said that God has given her healing and freedom from the weight of Charlie’s choices and from being known as ‘the shooter’s wife’ that tried to define who she was. These Christians walked the path that leads to new life through incredibly dark times. They lived out so much of Matthew 5-7, and they focused narrowly on Jesus’ teaching to forgive, to reconcile, and to comfort those who mourn. Matthew 5:4- “Blessed are you who mourn, for you will find comfort.” Matthew 5:23-24-“First go and be reconciled…” Matthew 6:12- “Forgive us our debts, as we have forgiven our debtors,” and Matthew 6:14- “For if you forgive others their trespasses, your heavenly Father will also forgive you.” Because of their narrow focus, they found new life. Christ’s teachings can help us through those difficult times as well, and lead us to new life. Let’s now focus on Jesus’ second warning, to beware of false prophets, wolves disguised in sheep’s clothing. There were faith leaders, prophets and philosophers in Jesus’ day who claimed to speak for God, people who seemed to have faithful ways, but when one focused upon the results of their lives, it was easy to see that they were false in their faith. There is a two pronged warning here. First, look at pastors and church leaders around the world, and at your local pastor and church leaders here. If we say one thing and do another; if we preach the love of God on Sunday, and treat our neighbors with hatred on Monday; If we agree to live out our faith as elders and deacons, but instead are poor examples to the community in how we treat others- then you will know us by our false fruits. You can judge the quality of our faith from the way we behave. The second part of this warning is not just for pastors and church leaders. It applies to disciples as well- to those who sit in the pews on Sunday. What kind of fruit do you bear in this world? Jesus expects results from our faith, that both leaders and disciples live out their faith and bear the fruit of that faith in the world. If the fruit you and your Christian leaders bear is good, such as the list by Paul in Ephesians- “love, joy, peace, patience, kindness, goodness, faithfulness, gentleness and self-control” (Galatians 5:22), then that faith is sound. Once you have found and travelled through the narrow gate, once you have proclaimed Christ as Lord and Savior of your life, there is a tough pathway ahead, one that if followed produces the fruit of faith. It is a pathway that you and I are called to follow each and every day. Sixteenth Century Protestant Reformer Martin Luther, in looking at this passage, wrote, “Christ himself and the whole heavenly host are at my side and have traveled this very same way, preceding me to heaven in a beautiful and long procession. Until the last day, all Christendom will be traveling on the same road…It is a yoke and a burden for the flesh, and it is a hard way and a narrow gate. But, Lord, cling to me, and you will give us enough strength to travel the road with ease.” God be with us on the road of faith, laid out by the teachings of Jesus. May Christ cling to us. May our focus be narrow, and our love be broad, so that they will know us by our fruits. Alleluia. Amen. Do you think Christians for the most part are narrow minded? When did you start to follow Christ in your own life? Have there been times when the path was hard? We are coming near to the end of Matthew 5-7. What has been the most challenging part of Jesus’s teaching for you?